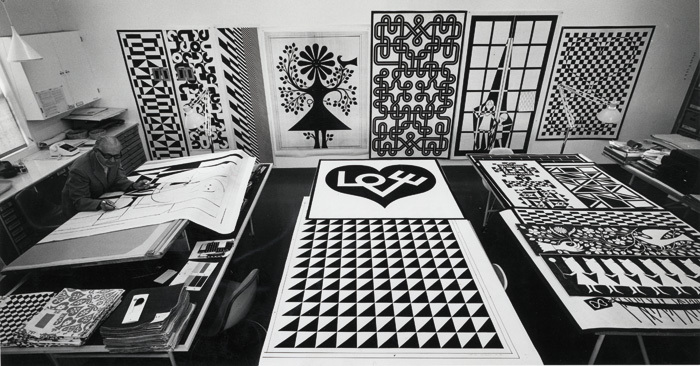 While a young pupil at a British boarding school in the Twenties, American-born designer Alexander Girard created his own imaginary country and secret society. Dreamt up in his spare time, from the age of just 10, his visions for the ‘Republic of Fife’ included mind-bogglingly complex details: he drew intricate maps of entire empires, made passports, created a currency of banknotes and painted pebble coins, invented games and even devised a set of cryptic languages and codes with which to communicate with his family. This highly elaborate project, though just the figment of a child’s imagination, sheds some light on what shaped Girard as a multi-talented interior architect, textile designer and artist, from his fascination with other cultures to his interest in design as a means of communication. 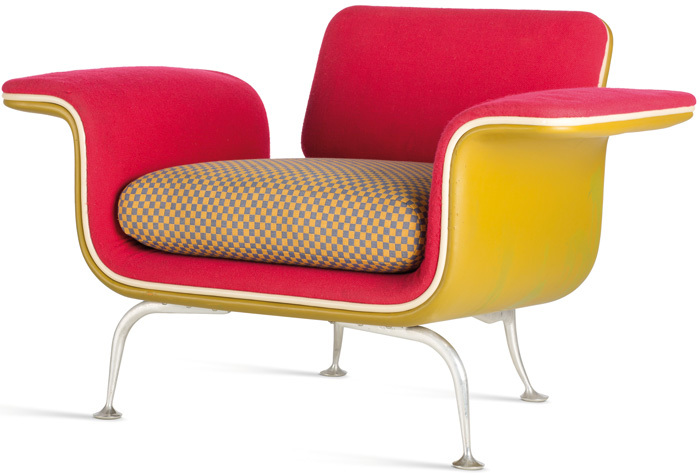 The Vitra Design Museum’s major retrospective, A Designer’s Universe, paints Girard as an inventive man of many talents: the designer of home interiors, restaurants, furnishings, exhibitions, typography, toys and aeroplanes, who has until now been relatively overlooked. Vitra acquired his personal estate in 1996, three years after his death, and it is from this collection of 10,000 drawings and photographs, sketches and textile samples that the exhibition is based. 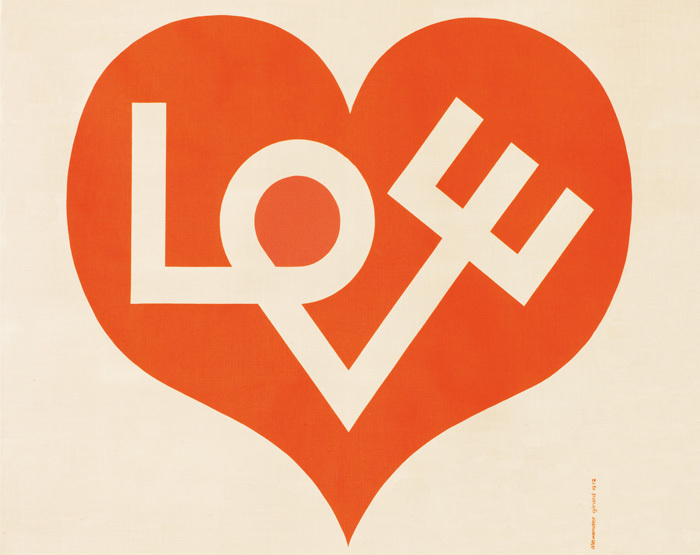 Girard is one of those unsung designers you might be familiar with for some of his more famous designs - his LOVE motif created in 1971 for Herman Miller and now used on Vitra merchandise for example, or his playful wooden dolls - but not necessarily know their name. Not one for self-promotion, Girard’s work has taken a back seat compared to some of his more famous contemporaries, such as close friends Charles and Ray Eames and George Nelson, in the history of post-war American design. This is in part because his work was mainly for private clients, partly because not all his projects have survived, and also because he unfashionably eschewed the clean, reductionalist approach of modernism in favour of joyful colour, pattern and elaborate decoration. Born in New York City in 1907, Girard, a truly international man, grew up in Florence, studied at the Architectural Association in London, spent time in Sweden, Paris, Rome and Michigan, before settling in Santa Fe, New Mexico. 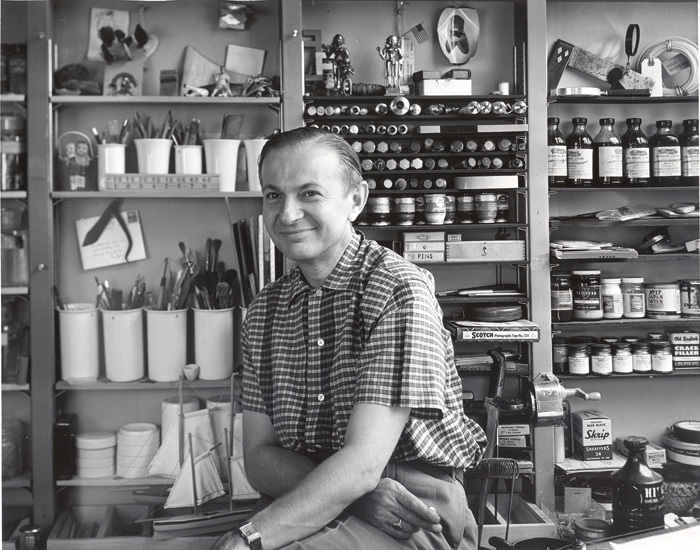 The exhibition depicts an early career designing furnishings and interiors for well-to-do clients, and later becoming head designer at radio manufacturer Detrola in 1943 then opening his own design shop and gallery in Detroit in 1945. It shows an inventive mind always trying new things; he experimented with plywood furniture for a time but put it to one side when he met Charles and Ray Eames and found they were doing a better job. In 1951, Girard was made director of the new textiles department at Herman Miller in Detroit, creating more than 300 fabrics with geometric shapes and natural motifs for the company over the next two decades. His most well-known works are the interiors of private homes, such as the Miller House in Columbus, Indiana (1957). Believing that an interior shouldn’t be purely functional, he envisioned vibrant, flexible spaces that, inspired by theatre design, became stages for everyday life. He saw them as constantly changing works in progress that could speak to the senses as the seasons evolved and the years went by. For the Miller House, designed with Eero Saarinen, Girard invented a dug-out ‘conversation pit’ for the living room, recreated in the middle of the Vitra exhibition space as a welcome resting place on the exhibition journey. Unusually for a designer, Girard continued to consult with the Millers during the next 20 years, returning to advise on decor or offer them objects from his own vast folk art collection. Amassed over 50 years, he collected more than 100,000 pieces of folk art and handmade toys from more than 100 countries, now housed at the Museum of International Folk Art in Santa Fe. They reflect his ability to respect the past and make something new that connected people, ideas and objects. His own home was seen as a living laboratory for experimentation, and regularly published in magazines of the time. 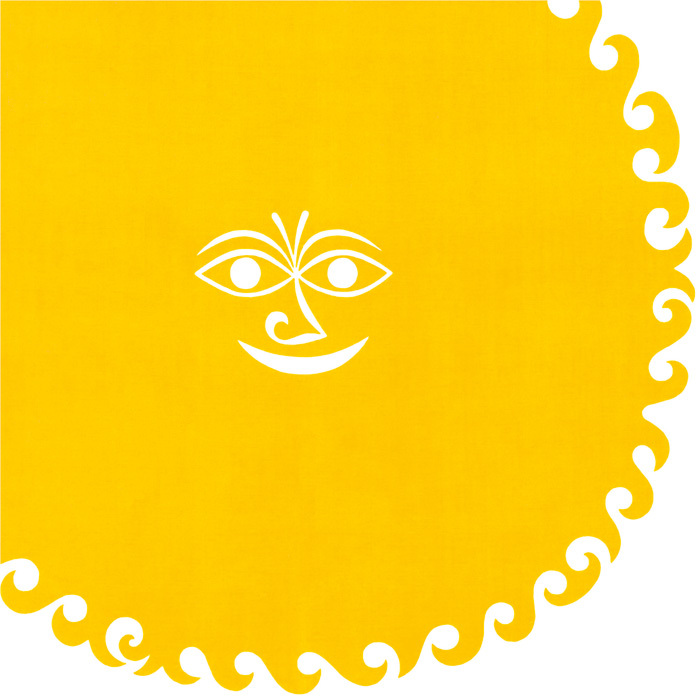 Other projects that stand out are his design for the theme restaurant La Fonda Del Sol in New York City (1960), where he created everything from the restaurant’s sun logo to tableware, cutlery, menus and sugar-cube wrappers, while the chairs were developed with Charles and Ray Eames. 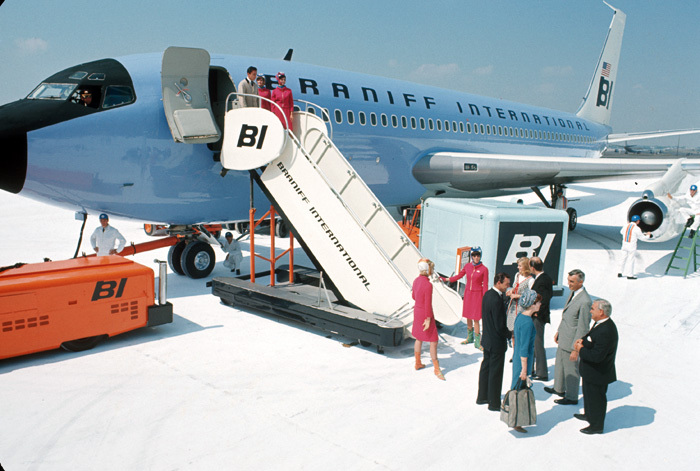 Another project, for Dallas based Braniff International Airways (1965), brings to mind the attention to detail first seen in his childhood project, the Republic of Fife, and his ability to create a total concept, a whole world. Tasked with creating a new look for the airline, Girard conceived a bold colour scheme for the usually drab and beige planes, a new, hippy typeface, logos and airport lounge interiors, while Pucci fashioned space-age crew uniforms. The exhibition, created in close consultation with Girard’s grandchildren, paints a vivid portrait of a man whose aim was to inject moments of pleasure and delight into everyday life. It takes you deep into his universe and captures the sheer joy Girard found in immersing himself in every little detail of a project.